Learning Underwater Photography has never been more convenient! 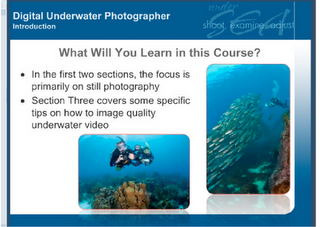 Anyone – divers or snorkelers – can enroll in PADI's newest eLearning course: Digital Underwater Photo Course online. After finishing the knowledge development online, you will complete the digital photography workflow workshop and in-water training for certification. “You've basically got two choices: learn all of this the hard way and end up with ugly photos of fish butts and backscatter - or take this class which is a shortcut to shooting underwater images you’ll want to show off to friends and family.” Come in to our facility to complete your training: While you're working through the PADI Digital Underwater Photographer course online or after you complete all the segments, you can print your eLearning Record and bring it in to start your underwater adventures. You’ll learn and master dive skills from one of our highly-trained PADI Instructors during pool and open water dives. The skills you learn during these dives will prepare you to explore a whole new world. Start today on a lifetime of adventure and fun! There are additional charges for in-water training.